Hello again strange and awesome people who are interested in our space game! We've been busy playing around with combat mechanics, especially those centered around player flagship, also known as the Mothership. The Mothership is the base of operations for all player activities, armed with an impressive main cannon and a sortiment of smaller weapons and devices. As the player progresses, she can also unlock access to new types of motherships, in addition to everything else. An important aspect of the motherships will be escaping (together with your fleet) from combat against stronger opponents by warpdrive technology. Charging up the warpdrives takes time, so escaping means basically survival & minimizing damage until you can jump away. If the mothership warpdrives happen to get damaged during the charging, the process will have to be restarted (after the drives have been repaired by your faithful crew, while the ship is most likely taking heavy enemy fire). The Mothership carries the smaller ships in it's internal hangars, also repairing and rearming them as needed. The mothership will also feature a detailed and totally awesome internal view, with little guys running around, repairing modules, manning guns, and fighting intruders. 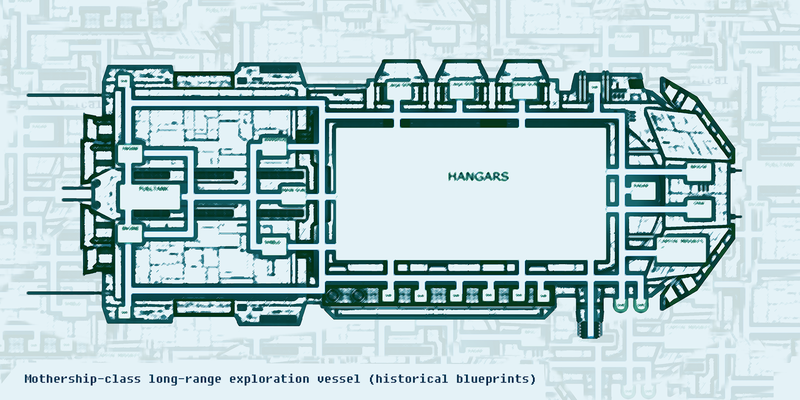 Since we cannot show the internal view in it's full glory and animated detail yet, we hope you are satisfied with the historical blueprints this time.